Did you know today is National Bird Watching Day? Yup, indeed it is. So it naturally behoves that the Birdwali Aunty choose birds as the topic for the day. Let not the name ‘Birdwali Aunty’ conferred on me by a little one lead you into jumping to erroneous conclusions, that I am an authority on birds or some such. Nyet. Nothing of the sort. I am but an amatuer, in it for the love of the wing-lings. It must have been only a little over a year ago that I started noticing the thingamabobs in earnest and thus resulted mutual love and respect . You don’t believe me? 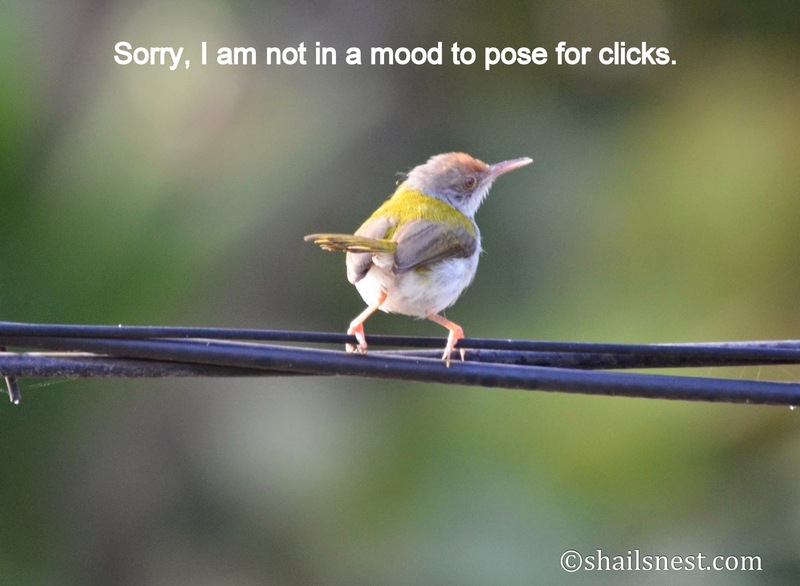 The White-throated Kingfisher wrote a post for me on how to swallow a worm (Warning: do not eat while reading or vice versa), the Tailor Bird took over for the day when I was feeling too sleepy to write. Then there was the time the Asian Koel came by to give me some solid advice (and what a big gamble that was as everyone and their great aunt probably know what I think of advice) and that other time when the wing-lings came by to wish me bon-voyage. Jokes apart, you cannot actually call me a birdwatcher, not that is in the truest and purest sense of the word. In case you do, you might run the risk of being pelted with stones, or at least boo-ed, by the *genuine* *blue-blooded* birdwatchers who are a breed apart, let me warn you. 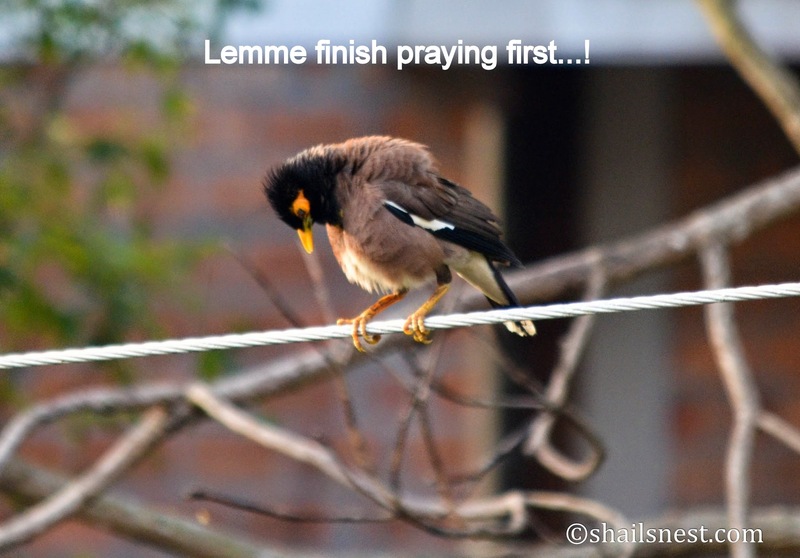 Of course, technically, I DO ‘watch’ (and shoot) birds, from my balcony, and sometimes nearby accessible places too. Not that I wouldn’t like to go places, far and wide, to watch (and shoot) the winged ones, but health does not permit me to push off into the wild like the *real* birdwatchers do. Anyways, be that as it may, let me tell you why today is National Bird Watching Day. On this day in 1896 was born Sálim Moizuddin Abdul Ali (12 November 1896 – 20 June 1987), the famous ornithologist and naturalist. From shooting a Yellow-throated Sparrow with his toy air gun at the age of 12 to being among the first Indians to conduct systematic bird surveys across India, also writing bird books that helped develop ornithology, and earning for himself the sobriquet of ‘Birdman of India’ his life had been an impressive journey indeed. 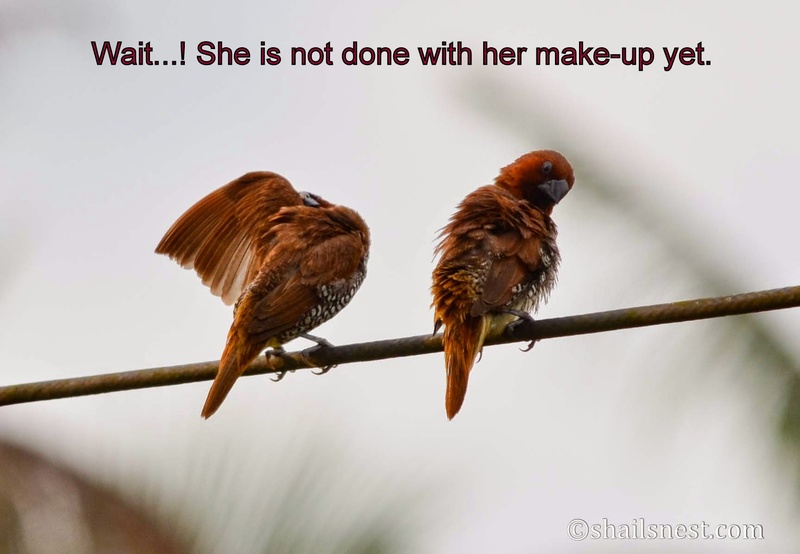 This being such an important day for birds and birdwatchers alike, I requested the Scaly breasted Munia couple to pose for me. As you can see from the picture on top, they took so long to get ready that I was forced to move on. Next came the Common Myna, who insisted on first saying a small prayer for the departed soul, which turned out to be a really long one indeed. 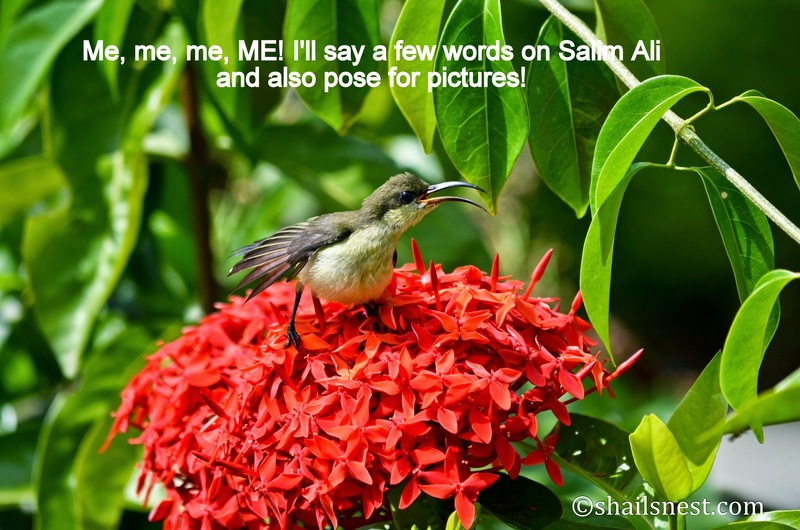 Finally it was the Loten’s Sunbird who saved the day by posing on a bed of ixora and even saying a few words on the day and on the great man. Here is where I do the plugging for my bird blog, Only Birds. Don’t worry, this is not a call for comments; in facts comments have been disabled on the page. It is strictly for viewing pleasure. If you love bird pics, go right ahead and give it a look-see. Of course, what else to expect of the Bird-lover on this special day !! I love the pictures you take and the captions you put .. Didn’t know about the ‘birdman of India’, thanks for sharing .. Heyy!! I love the tailor bird and the caption!!! Goes perfect together! It is kinda cute the way its legs go! 😀 Thanks.